A Thousand Paper Cranes. Peace on Earth and in the Heavens. Inscribed, in the handwriting of Yukawa, on the surface of the bell inside the Children’s Peace Monument at Hiroshima, Japan. The crane is a symbol of longevity and happiness in Japan. 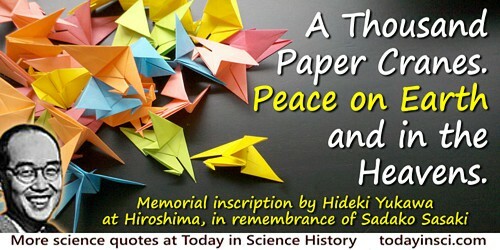 The monument to mourn all the children whose death was caused by the atomic bomb was inspired by 12-year-old Sadako Sasaki, who believed that if she could fold 1000 paper cranes she would be cured of the leukemia that resulted from her exposure to the radiation of the atomic bomb when two years old. She died before completing them.